What kind of relationship would India have with Pakistan if Narendra Modi assumes office come May? Would he be a threat to its western neighbour? Will his presence at the helm revive fresh fears in the region? The Bharatiya Janata Party (BJP) did not assuage any fears as it released its manifesto few days ago. The 52-page document included a possible revision of India’s No First Strike policy, an old doctrine that states that India would not be the first one to use atomic weapons in any armed conflict. Modi is a controversial Hindu right-wing hardliner who cares little for minorities, particularly Muslims. As victims suffered and perished the Gujarat Chief Minister’s political graph soared with each election. After effectively neutering Gujarati Muslims as a voting bloc, whatever and wherever he is today is due to what happened twelve years ago. Modi was also a flag-bearer in the early 1990s when a Hindu mob in Ayodhya, led by BJP stalwarts like LK Advani, demolished a 16th century mosque commissioned by the Mughal emperor Babar. Liberal and pluralistic India nurtures a deep-seated concern about such a politician. Pakistan also cannot remain immune. The very fact that the Modi-inspired manifesto talks of a revision of India’s nuclear doctrine implies a natural escalation of tension with Pakistan. It also implies an escalation of divisive rhetoric and war-mongering under the guise of economic integrity and engagement. It was the Hindu right-wing government under Atal Behari Vajpayee that decided to test its nuclear weapons in 1998, an ominous beginning to South Asia’s nuclear age. Despite some major obstacles, both sides have made efforts to normalize the long-suffering relationship over the past decade. The focus has shifted from military buildup to trade. Pakistan seeks to expand its economic engagement with India, which New Delhi also realizes is important. India also understands that it cannot prosper without taking its neighbour along. Modi’s presence threatens to upset this path; it dampens the developing spirit of camaraderie between the two nations. The leader’s recent attacks on Arvind Kejriwal, the leader of the upstart Aam Aadmi party, as a Pakistani agent is indicative of his hostility not just for Pakistan, but for those in India who are even slightly perceived to be pro-Pakistan. This rhetoric is reflective of a medieval mindset; it is aimed at shaming Pakistan and those who wish to engage with it. The BJP manifesto also talks about revoking Jammu and Kashmir’s special status as an autonomous state. Any attempt to tamper with Kashmir will have an immediate counter-reaction in Pakistan, which views the territory as its own. If this happens Delhi’s relationship with Islamabad will naturally atrophy. Such attempts will have a destabilizing effect on Pakistan. Any attempt to question the status quo in Kashmir and reverse the nuclear doctrine will have a strong reaction. It will give a new life and energy to the forces which have thrived on animosity between the two South Asian neighbours. 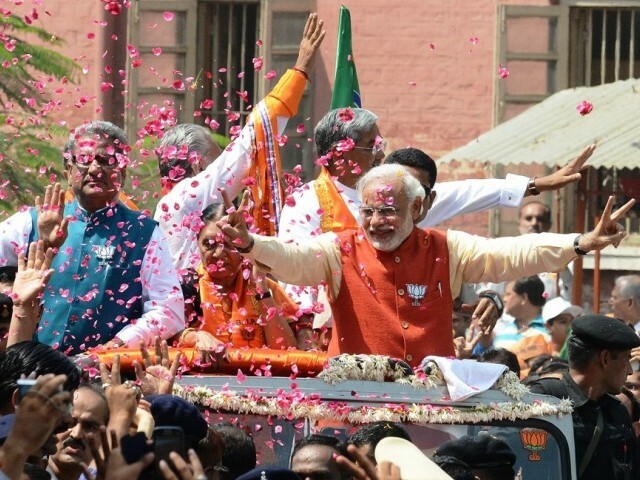 The combination of reactionary policies in the Hindu right-wing’s manifesto with the anti-Muslim image of Modi is putting South Asia on a very dangerous path. He is a challenge to the conscience of South Asia. Sanjay Kumar is a New Delhi-based journalist. He is currently covering elections in Afghanistan.